Rain Defence Roofing have built an excellent reputation for being a high quality, reliable flat roofing company throughout the Nottingham / Derby area. We are flat roofers with years of experience solving leaking flat roof problems. We specialise in the installation of EPDM rubber flat roof membrane, which is far superior to felt, with a much longer lifespan. 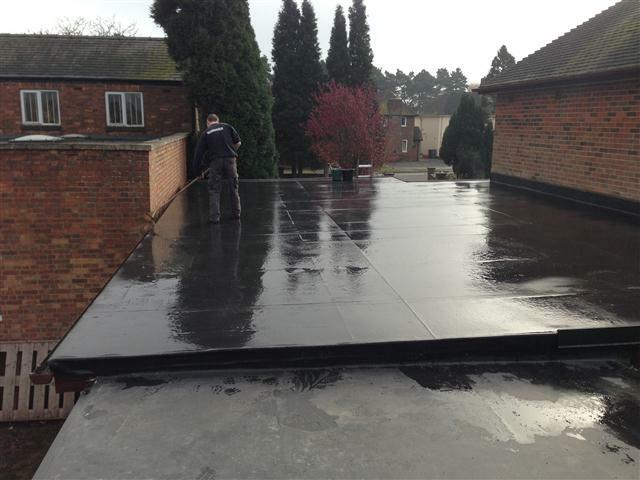 We can replace your existing leaking flat roof with an EPDM rubber flat roof, with a twenty year guarantee from Rain Defence Roofing, plus an additional ten year insurance backed guarantee. You can then relax, safe in the knowledge that your home is protected, no matter the weather! We have replaced hundreds of flat roofs throughout Nottingham / Derby and have hundreds of satisfied customers. EPDM roofs are fully adhered to a new timber deck which means there is no need for any stones or other ballast to hold the roof down and as they are UV resistant, there is no need for any protective paint or coating. They’re maintenance free, pleasing to the eye and very durable. We leave every customer delighted with their new flat roof. We cover both domestic and commercial flat roof installation and replacement. Whether you are in Derby, Nottingham or even if you are further afield, give us a call if you have a problem and we can help. We do the job right. You’ll never have another leak. We are based in Wollaton, Nottingham and mainly cover the Midlands area, including Nottinghamshire and Derbyshire but we are happy to go further afield so if you live elsewhere, just give us a call. Call us on 01159 250 283 or mobile 07411 806 185 for a free quote. Take a look below for feedback from some of our delighted customers! Our main work is the replacement and installation of flat roofs to both commercial and domestic buildings. We also install fascia and guttering. We don’t just replace, we also fit new build roofs and have installed hundreds of flat roofs over the years. Whether you have a garage, an extension, an outbuilding, a bay window or anything else we can handle it. Call 01159 250 283 or 07411 806 185 to arrange a quote or for some free friendly advice. 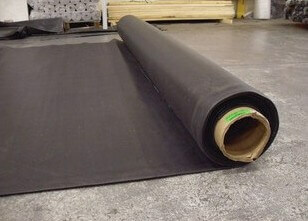 What is EPDM rubber roof membrane? EPDM, which stands for Ethylene Propylene Diene Monomer is a rubber membrane that has been fitted to millions of flat roofs worldwide since the first Firestone rubber roofs were installed in 1980. It has several major advantages over other flat roofing systems like felt, butyl, asphalt and GRP (fibreglass). These include being flexible so it can expand and contract with the building as temperatures vary, plus being completely inert, so unaffected by heat or light. This means it doesn’t shrink or crack. It is also available in very large sheets, meaning most domestic and some commercial installations (depending on size) can be fitted in one piece. If you want a flat roof that will not let you down in years to come, you need an EPDM roof, fitted by Rain Defence Roofing! Why use Rain Defence Roofing? If you want local flat roofers with a wealth of experience solving leaking flat roof problems, then call us. We have a great reputation around the Nottingham and Derby area as we do an excellent job and make sure that you are left with a neat and tidy roof that will never leak again. We are Which Trusted Traders, also members of both the Federation of Small Businesses and also the Confederation Of Roofing Contractors (membership no 7193). We’re also licensed Firestone EPDM roofing contractors. All of our work is guaranteed and we treat every home like our own. Once you’ve got us booked in to fit your roof you can relax and let us take care of the rest. We won’t let you down. Give us a call today and let us solve your leaking flat roof problems. Do you need reliable roofers from a company you can trust? Contact us now for a free quote!